Now with snap-on Grippeez for improved fit and better retention in the ear. Breppies are little socks that slip snugly onto your earbuds to provide a little splash of color, as well as adding protection for your earbuds, keeping them cleaner and making your earbuds much more comfortable. Breppies are highly recommended for use during workouts. Breppies help to keep your earbuds from falling out of your ears during exercise, they help protect your earbuds, and they allow you to personalize your standard ipod or iphone earbuds so you know yours when you see them. 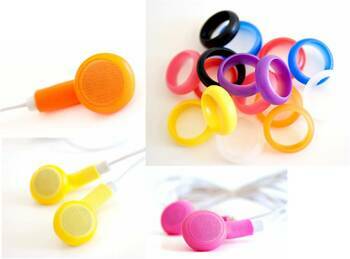 Breppies earbud Covers (Pack of 1 Pair of Breppies + Grippeez! )5KimSeptember 20, 2013The product is exactly as described. The grey rings came off my iphone eabuds and these were a perfect fix! My only complaint is that the website charged me $4.95 in shipping for a $2.95 item. Make shipping more reasonable.